Monta Vista junior Dana Underwood, heading down the stretch at the league finals, finished seventh in the CCS Division 1 finals. Jason Yow and Dana Underwood ran in different races at the Central Coast Section (CCS) cross country championships at Toro Park in Soquel last weekend—but their accomplishments were very similar. Both Monta Vista runners finished in the top 10 in their races, and both of them led the Matadors into the top 10 in the CCS Division 1 team standings. Yow was third in the division, running 16:15 on the 3.0-mile course to lead the Monta Vista boys to a seventh-place finish, and Underwood was seventh in 19:55 to lead the Matadors to a team fourth. 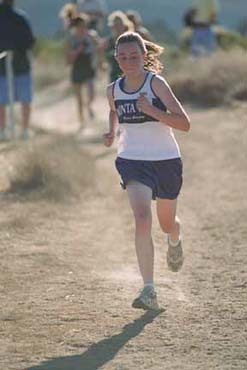 Underwood, a junior, was one of five Mats in the top 40 to help the Monta Vista girls to a strong showing in the team standings. Aptos ran up a low 41 points to win the team title, with Milpitas second at 45, Silver Creek third at 93, Monta Vista fourth at 100 and Salinas fifth at 117. Underwood was seventh, with junior Jillian Blake-Burke 18th in 21:10 and senior Christine Yow 22nd in 21:26. Three freshmen came in next for the Matadors—Vanessa Shih was 28th in 21:41, Katie Stroub was 38th in 22:07 and Connie Shieh was 42nd in 22:24. Junior Joy Kim ran 60th in 24:31 for the Matadors. J. Yow, a sophomore, led the Monta Vista boys to their solid team showing. Yow finished third, just five seconds behind first-place Dominic Vogl of Serra (16:10) and just an eyelash behind runner-up David Muerer of Salinas (16:15). Both Vogl and Muerer are juniors. Yow, who ended up 12th overall in CCS with his effort, led the Mats to a team seventh behind Serra, Salinas, Silver Creek, Bellarmine, Milpitas and San Benito. Watsonville finished eighth in the team poll, with Live Oak ninth and Fremont 10th. Monta Vista freshman Ian LaForm supported Yow's finish with a 22nd in 16:55. Freshman Scott Russell was 28th in 16:59, with senior Drew Fetterman 55th, senior Stuart Jones 57th in 17:46 and senior Julian Kolev 60th in 17:51. Mike Pullano led Fremont to the team 10th by running 30th in 17:03. Supporting the senior standout was junior Austin Sardella, 40th in 17:25. Homestead junior Rebecca Boyle finished a respectable 25th in 21:17. In the boys Division 2 race, Homestead freshman David Pochowski ran a solid 17:39 to finish 27th overall. Lynbrook junior Eugene Berson was 36th in 17:53. In girls Division 3 competition, Cupertino sophomore Lisa Chang romped to a 27th-place finish in 20:20. Cupertino senior Brian McDonough ended up 38th in 17:21 in the boys CCS Division 3 race.